It has taken Hollywood more than fifty years to produce a rebuttal to Arthur Penn’s classic Bonnie and Clyde. In the romanticized 1967 gangster film, law enforcement in general and Frank Hamer in particular were portrayed as bumbling up until the final ambush. John Lee Hancock’s The Highwaymen shows, as Paul Harvey was fond of saying, “the rest of the story.” In this iteration of Bonnie & Clyde’s final act, Hamer (Kevin Costner), is presented as a solid, competent lawman who divines the doomed couple’s location not through luck (as in Bonnie and Clyde) but as a result of deduction and investigation. Although nowhere near as lush, artistic, and downright entertaining as the Warren Beatty/Faye Dunaway interpretation, The Highwaymen hews closer to the historical facts (with the climactic ambush being filmed on-location where it happened). Despite arguments by Hancock to the contrary, there are times when John Fusco’s screenplay accepts unproven myths and legends (especially about Bonnie) as facts. The story starts with Texas governor Ma Ferguson (Kathy Bates at her sourpuss best) holding her nose and reluctantly agreeing to bring back retired rangers Frank Hamer and Maney Gault (Woody Harrelson) to supplement the “official” police and FBI taskforce tracking Bonnie and Clyde. While the younger agents and cops working the case aren’t openly antagonistic toward the “old timers,” neither are they deferential. But Frank’s tenacious, methodical approach works where the newfangled technology-driven methodology fails. The climactic ambush is staged differently than the one in Bonnie and Clyde. In addition to being shown from the lawmen’s perspective, it’s less over-the-top. As was the case in real life, Clyde doesn’t get out of the car and there’s no long, wordless exchange of loving looks between the two outlaws. The sickening souvenir-hunting that follows the massacre is reflective of what happened and says something ugly about human nature. Although there is some humor in The Highwaymen, it (like everything else in the film) is dry. The movie is at times too serious for its own good and the borderline-dour tone deflates the “buddy film” aspect. It’s as if director John Lee Hancock (Saving Mr. Banks) wanted to put as much distance between his movie and the one made a half-century ago by Arthur Penn that he avoids anything that could be misinterpreted as campy. In the process, however, he leeches some of the fun out of the proceedings. The screenplay had been kicking around for more than a decade before the project finally moved into production. In its nascent stage, it had been envisioned as one last Redford/Newman pairing. After Newman’s death, Redford backed out. The next iteration matched Harrelson with Liam Neeson; when the latter wasn’t available, Costner stepped in. Watching the Dances with Wolves actor in this role, it’s hard not to remember his turn as Elliot Ness and, although the two lawmen are dissimilar in many ways, Costner’s portrayal of Frank shows how much he has grown as a performer over the years. He’s relaxed, confident, and exhibits solid chemistry with Harrelson. However, although the two actors work well together, The Highwaymen might have benefitted from more time exploring their relationship. That aspect is too thin to satisfy. 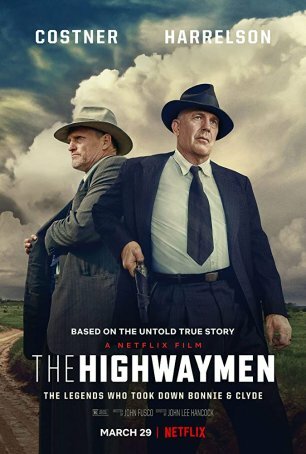 The Highwaymen’s straight-to-Netflix distribution should boost its profile. Although it would have been a close call to recommend for theatrical viewing, I have no reservations about endorsing it for home viewing. It’s a solid, mostly factual reflection of events that have embedded themselves in the Depression-era’s gangster mythology. No film is ever going unseat Bonnie and Clyde as the “definitive” telling of the crime duo’s exploits but The Highwaymen’s different outlook makes it a worthy, if lesser, companion piece.